This was fun! It wasn't mind blowing or anything but I certainly enjoyed myself while reading it. There were definitely some exciting moments in the story and a few surprises. I found myself wondering if the crew members would be able to survive their situation at the same time I was focused on the identity of the characters. I really liked that the story took a few turns that I really didn't see coming that added a lot to the story. This was a really strong start to a new series. The Admiral starts the story by being resuscitated after his sleeper cell malfunctions. 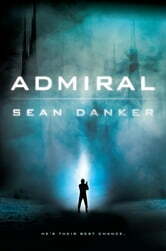 He recovers and realizes that he is on a dead ship with three new recruits. He assumes command and they start to take steps to ensure their survival. They soon realize that the situation is worse than they feared and the planet isn't stable. Will the group be able to work together to get off of this planet? The characters were one of the main strengths of this book. We never learn the admiral's name or really too much about him but I still really liked him. He was a natural leader and was able to think fast and get the group through many situations. The three recruits were all very different and their personas worked well together in the story. Had they all been distrustful of the admiral it would not have had the same effect as it did with one very distrustful recruit. I liked how they learned to become a team when necessary. I thought that the pacing of the story was well done. There are so many things that this group has to get through that there is never any time for the story to really slow down much at all. I thought that the mystery of the admiral's identity was an interesting element. I do wish that we had learned something a bit sooner than we did but he was a great leader without any background on him. It added a nice mystery to the story. I would definitely recommend this book to fans of science fiction. I didn't think that the science fiction in this story was heavy at all and this one should appeal to a wide range of readers. This is the first book by Sean Danker that I have read and I plan to continue with this series as soon as the next book is released. I received an advance reader edition of this book from Penguin Publishing Group - Roc via First to Read for the purpose of providing an honest review. Good read. Enjoyed it very much. Looking for the next chapter in this story.